RealPlayer works as a Music player and also supports conversion of Media files into MP3. Nowadays, many people have forgotten about Real Player or Real Audio files with the entry of latest media players like iTunes, VLC and other media players. If you are looking for an Real Audio converter, then you have come to the right place. Here you will find out about how to convert RealPlayer files to MP3 with the help of two different applications. 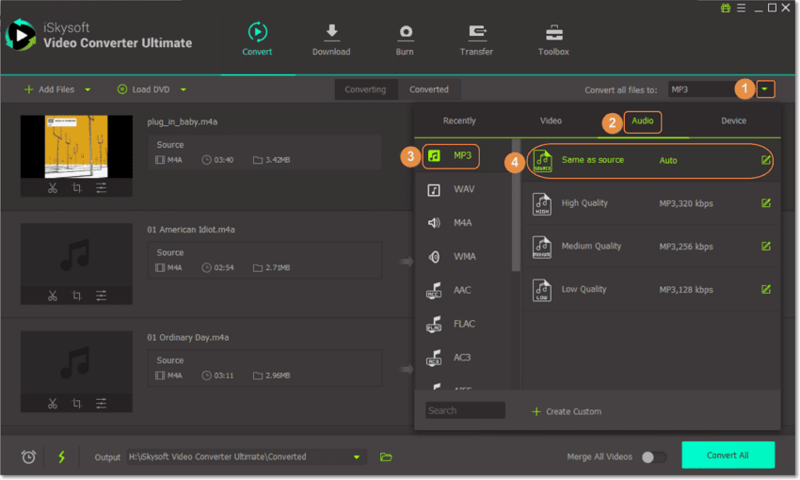 Find out more about how to use RealPlayer and iSkysoft Video Converter Ultimate for converting Real Audio files to MP3. iSkysoft Video Converter Ultimate is the best RealPlayer to MP3 Converter. 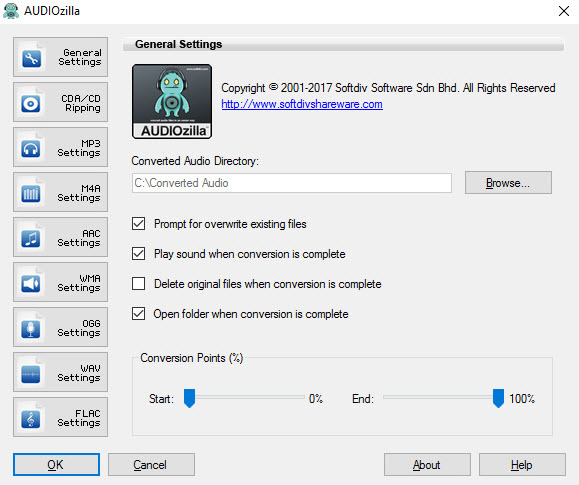 It is an easy to use and powerful audio converter, which can extract Real Audio files from Internet or any other platform and convert them into MP3 for smooth playback of your favorite music files. It can easily convert any Real Audio file extension such as RMVB, RM or RA files into MP3 with original data. Perform batch conversion processing of Real Audio files or merge them into one music file easily. Convert Real Audio files into MP3, WMV, WMA, AAC, AIFF and more than 150+ video and audio formats with 90X speed. Download from 10,000+ online streaming video sites such as Facebook, Instagram, Hulu, Netflix, Metacafe, etc. Stream MP3 files in your TV, iPod, Chromecast, Apple Devices and other portable devices. Edit your MP3 file before conversion with features like trim, bitrate, volume settings, etc. Totally compatible with Windows 10/8/7/XP/Vista and macOS 10.13, 10.12, 10.11, 10.10, 10.9, etc. 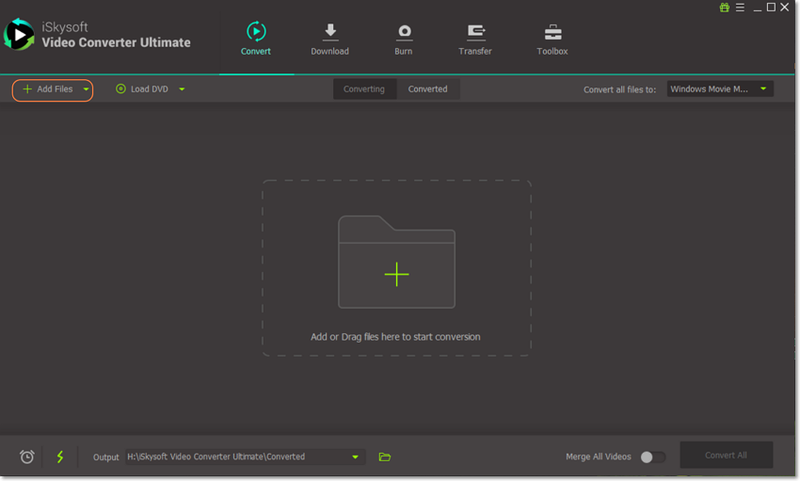 Launch iSkysoft Video Converter Ultimate and start adding Real Audio files into the program. Drag and drop the real audio files or use ‘Add files’ to load Real Audio files. Now, select ‘Audio’ Profile and select MP3 with any specific bitrate as per your requirement. Modify Audio parameters if needed. From the Output folder, use the Browse icon to choose a file destination to save the converted MP3 file. 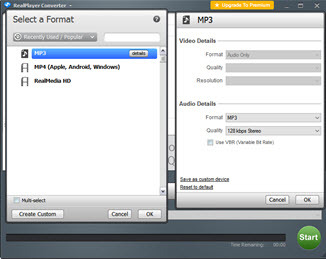 By clicking ‘Convert’ button, you can start the Real Audio to MP3 file conversions. RealPlayer works as a media player and converter which can perform various multimedia conversions. 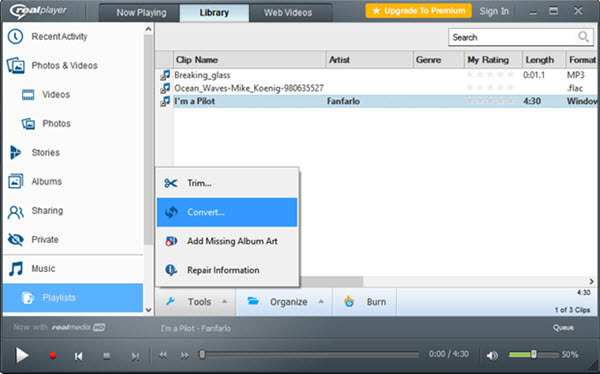 Easily turn any audio or video file into MP3 by using this program. It is a popular program for audio conversions as it can convert any audio file into MP3 within few minutes. It also maintains the audio quality. You can also modify the audio settings to enhance its quality. Step 1: Open RealPlayer and Choose Audio File from the Library. Go to RealPlayer Media Library and select the target music file. Go to ‘Tools’ and select ‘Convert’ option to start the conversion process. It will open a new RealPlayer converter window, where you can start adding any number of Audio files by clicking ‘Add..’ button. After adding the target Audio files, select ‘MP3’ from ‘Convert to’ option. Select ‘Details’ button from the chosen output format and edit MP3 audio settings if needed. You can change audio settings such as Audio Quality, Use VBR, Save as Custom Device and so on. Now, go to ‘Save In’ drop down menu and select any folder for saving the converted MP3 file. Finally, click ‘Start’ to start Real Audio to MP3 conversion. You can also Pause or Cancel conversion process, if you want to make any changes. The Audio files will be converted into MP3 within seconds. Tips: What are RealPlayer Media Files? Real Audio files can be streamed in Real Player Application. Real Player is available for free which can be downloaded for free of cost. Real Player files always have media extensions such as RAM, RA, RM or RAX. It is known for its ability to perform smoothly with low bandwidth audio files. That’s why it is mainly used by Internet Radio Stations for playing any audio file. You can download its current version of Real Player 10 from its official website. It was mainly developed to stream any audio/video file during its downloading process. Which means that you can listen or watch any media file when it is getting downloaded.